Upon the public release of Jerome Powell's Wednesday speech, came the Bloomberg headline: "Powell: No Preset Policy Path, Rates 'Just Below' Neutral Range." When the Fed Chairman began his presentation to the New York Economic Club just minutes later, the Dow had already surged 460 points. From Powell's prepared comments: "Interest rates are still low by historical standards, and they remain just below the broad range of estimates of the level that would be neutral for the economy‑‑that is, neither speeding up nor slowing down growth." When he read his speech, he used "range," as opposed to "broad range" of estimates. Equities responded to the Chairman's seeming dovish transformation with jubilation (and quite a short squeeze). It certainly appeared a far cry from, "We may go past neutral, but we're a long way from neutral at this point, probably," back on the third of October. Powell's choice of language was viewed consistent with the 'much closer' to the neutral level, as headlines ascribed to vice chair Richard Clarida. What he actually said in Tuesday's speech: "Although the real federal funds rate today is just below the range of longer-run estimates presented in the September [Summary of Economic Projections], it is much closer to the vicinity of r* than it was when the FOMC started to remove accommodation in December 2015. How close is a matter of judgment, and there is a range of views on the FOMC." The "neutral rate" framework is problematic. Back in early October, the Fed was almost three years into a "tightening" cycle (first rate increase in December 2015). Yet the Atlanta Fed GDP Forecast was signaling 4% growth; consumer confidence was near decade highs; manufacturing indices were near multi-year highs; corporate Credit conditions remained quite loose; and WTI crude had just surpassed $75 a barrel. The S&P500 traded only fractionally below record highs in the hours before Powell's evening of October 3rd "long way from neutral…" With unemployment at (a multi-decade low) 3.7% and CPI up 2.3% y-o-y, there was a reasonable case at the time that significantly higher interest rates would be necessary for policy to reach some so-called "neutral rate." In our age of speculative financial markets dictating overall financial conditions, major backdrop shifts unfold in spans of days and weeks. The S&P500 dropped about 10% from early-October highs, while corporate Credit conditions tightened meaningfully. The Atlanta Fed GDP forecast has dropped to 2.6%. Consumer confidence has weakened, and housing has slowed. WTI is trading near $50, down about one-third from early-October. One could argue the so-called "neutral rate" has collapsed in recent weeks. Did it jump, along with hyper-volatile stocks, this week? I'm not taking exception with the market's view of a more dovish Fed. Of course, they are going to turn more cautious in the face of a significant tightening of financial conditions. At the same time, I expect they'll be keen to jump back on the normalization track if markets rally and financial conditions loosen. When the Fed says "data dependent," I would read "market dependent." Market conditions will lead the data. The substance of both Powell and Clarida's presentations were more balanced than dovish. Powell's Wednesday presentation was titled, "The Federal Reserve's Framework for Monitoring Financial Stability" (with a reference to Hyman Minsky!). The Fed's introductory Financial Stability Report had been published the previous day. "This report summarizes the Federal Reserve Board's framework for assessing the resilience of the U.S. financial system and presents the Board's current assessment. By publishing this report, the Board intends to promote public understanding and increase transparency and accountability for the Federal Reserve's views on this topic. Promoting financial stability is a key element in meeting the Federal Reserve's dual mandate for monetary policy regarding full employment and stable prices." I appreciate the Fed's attention to financial stability, stating explicitly the central role it plays within its broader mandate. Powell's speech offered a definition of "financial stability:" "A stable financial system is one that continues to function effectively even in severely adverse conditions. A stable system meets the borrowing and investment needs of households and businesses despite economic turbulence. An unstable system, in contrast, may amplify turbulence and prolong economic hardship in the face of stress by failing to provide these essential services when they are needed most." It's a commendable effort to craft such complex subject matter into a characterization accessible to the general public. However, I would broadly argue that unfettered contemporary finance - dominated by securities markets, derivatives and speculative trading - is an "unstable system." Conditions will gravitate to excessive looseness during booms, only to tightened dramatically come the inevitable eruption of "risk off." The monetary policy approach that evolved from serial boom and bust dynamics has been to backstop marketplace liquidity, while assuring participants that central banks will respond aggressively in the event of market or economic instability. By extending boom phases, this policy doctrine has created the allusion of stability for an innately unstable system. Significant thought and effort went into crafting the Fed's 37-page document. It is full of important data and insight. And, from my perspective, it as well illuminates key holes in the Fed's approach to monitoring financial stability. There's certainly a "generals fighting the last war" predisposition embedded within the Fed's analytical framework. The Fed's "framework focuses primarily on monitoring vulnerabilities and emphasizes four broad categories based on research:" "Elevated Valuation Pressure;" "Excessive Borrowing by Businesses and Households;" "Excessive Leverage in the Financial Sector;" and "Funding Risks." The Fed's current "financial stability" framework would have been generally suitable for the previous "tech" and "mortgage finance" Bubbles. These periods were characterized by major expansions in corporate debt, household borrowings and U.S. financial sector leverage, with financial intermediaries issuing huge quantities of perceived safe short-term liabilities to finance increasingly risky long-term assets. Today's "global government finance Bubble" has markedly different dynamics. Most consequential, rapid expansion and leverage have characterized government and central bank balance sheets - across the globe. The U.S. cycle, in particular, has experienced an extraordinary expansion of government borrowings. After ending 2007 at $6.051 TN, outstanding Treasury debt expanded 182%, to end June at $17.091 TN. Treasury debt growth is now projected to surpass $1.0 TN annually for the foreseeable future. For this cycle, traditional analysis of household and corporate balance sheets will underrate systemic risk. The problematic balance sheet expansion has been in the government sector, debt growth that has worked to this point to bolster household and corporate finances. The federal borrowing and spending boom has inflated Household incomes, while inflating Corporate sector profits. Nonetheless, according to the report, "After growing faster than GDP through most of the current expansion, total business-sector debt relative to GDP stands at a historically high level." Traditional analysis has also been distorted by the past decade's extraordinary monetary policy backdrop. Low rates and QE (growth in central bank liabilities) significantly reduced debt service costs (slowing household debt growth), while dramatically inflating Household Net Worth (Net Worth up 80% since the crisis to a record $107 TN). For the Corporate sector, unprecedented loose finance reduced debt service and the overall growth in corporate borrowings, while providing inexpensive finance for stock buybacks, M&A and easy EPS growth. QE-related liquidity was funneled into corporate coffers already bloated from enormous federal deficit spending. With ongoing extraordinarily low market yields and federal deficits, I would argue that traditional valuation metrics will also understate systemic vulnerabilities. The previous crisis illuminated how quickly a perceived sustainable profit boom can implode spectacularly. Fed analysis has stock market valuation on the high-end of the historical range. I would argue that today's inflated profits are unsustainable and extremely vulnerable to the downside of a phenomenal cycle. Ignoring the federal government balance sheet is a critical shortcoming of the Federal Reserve's "financial stability" framework. Fed officials would surely prefer to stay clear of fiscal politics, but the harsh reality is that monetary policy promoted unprecedented debt issuance and a tolerance for fiscal irresponsibility that has run unabated throughout a protracted economic boom. Treasury yields remain extraordinarily low in the face of a rapid deterioration in the Treasury's Credit profile. The report also didn't address potential financial stability issues associated with the scantly-capitalized government-sponsored enterprises and their almost $9.0 TN of outstanding agency (debt and MBS) securities. A spike in yields - a scenario not to be dismissed considering the risk trajectory of Treasury and agency obligations - would have a momentous impact on U.S. and global financial stability. The Fed's analysis of "leverage in the financial sector" is interesting, especially considering their own balance sheet provided much of the leverage for this cycle. "Leverage at financial firms is low relative to historical standards…" "A greater amount and a higher quality of capital improve the ability of banks to bear losses…" "Capital levels at broker-dealers have also increased substantially relative to pre-crisis levels, and major insurance companies have strengthened their financial positions since the crisis." The Fed then turns nebulous. "…Some indicators suggest that hedge fund leverage is as post-crisis highs." "Several indicators suggest hedge fund leverage has been increasing over the past two years." Our central bank (along with others) doesn't have a good handle on speculative leverage. They place hedge fund "total assets" at $7.27 TN, having expanded 13.5% over the most recent year (2017). "A comprehensive measure that incorporates margin loans, repurchase agreements (repos), and derivatives-but is only available with a significant time lag-suggests that average hedge fund leverage has risen by about one-third over the course of 2016 and 2017." "The increased use of leverage by hedge funds exposes their counterparties to risks and raises the possibility that adverse shocks would result in forced asset sales by hedge funds that could exacerbate price declines." Without a well-defined and comprehensive analysis of global speculative finance, an insightful appraisal of financial stability will remain forever elusive. There are questions fundamental to gauging financial stability. Rest of World (from the Fed's Z.1) holdings of U.S. financial assets have more than doubled since the end of 2008 to $27.5 TN. U.S. Debt Securities holdings were up 55% to $11.252 TN. How much foreign-sourced leverage has been behind the enormous flows into U.S. securities and financial assets - speculative, financial sector and central bank leverage? How vulnerable is global dollar liquidity to a bout of "risk off" speculative deleveraging? How vulnerable are inflated U.S. asset markets to the end of global QE and the deleveraging of central bank balance sheets (i.e. EM central banks selling U.S. securities to support faltering local currencies)? The Fed's financial stability report touches on global risks, including Brexit, Europe, dollar-denominated EM debt and China. But I would argue that the U.S. economy and markets are more susceptible to global forces today than ever before. It's difficult to envisage a scenario of a bursting Chinese Bubble and faltering EM and Europe that doesn't have profound consequences for U.S. financial stability. Global fragilities alone pose great systemic risk for the U.S. Combined with our stock market and asset Bubbles, escalating fiscal risk, corporate Credit vulnerability and deep structural economic maladjustment, the prognosis for financial stability is dire. The Fed's fourth broad category is "Funding Risk." "A measure of the total amount of liabilities that are most vulnerable to runs, including those issued by nonbanks, is relatively low." I don't disagree that "bank funding is less susceptible to runs now than in the period leading up to the financial crisis." "An aggregate measure of private short-term, whole- sale, and uninsured instruments that could be prone to runs-a measure that includes repos, commercial paper, money funds, uninsured bank deposits, and other forms of short-term debt-currently stands at $13 trillion, significantly lower than its peak at the start of the financial crisis." But… "Total assets under management in corporate bond mutual funds and loan mutual funds have more than doubled in the past decade to over $2 trillion… The mismatch between the ability of investors in open-end bond or loan mutual funds to redeem shares daily and the longer time often required to sell corporate bonds or loans creates, in principle, conditions that can lead to runs, although widespread runs on mutual funds other than money market funds have not materialized during past episodes of stress." Throughout this Bubble period, I have referred to the "Moneyness of Risk Assets." A "run" on money-like Credit instruments sparked the collapse of the mortgage finance Bubble. Runs unfold when holders of perceived safe and liquid instruments suddenly recognize risk is much greater than previously appreciated. Past crises have typically originated in the money markets. But never have central bank and government policies so fostered the perception of safety and liquidity ("moneyness") for risk assets - equities and corporate Credit, in particular. I would argue the proliferation and massive growth of index fund products poses a major risk to financial stability. And when it comes to policy-induced distortions, already extraordinary risks to financial stability are only compounded by the proliferation and growth of derivative trading strategies, both retail and institutional. One might ponder the notion of financial stability when the S&P500 sinks 3.8% one week and then rallies 4.8% the next. Expectations are now high that the Fed will be soon winding down "normalization," and that President Trump is hankering to strike a deal with the Chinese. Should be an interesting weekend. It was an interesting market rally - or lack of a rally in corporate Credit. Leveraged loans had a notably poor week. High yield debt remains suspect with crude at $50. Weak link GE was notably weak in the face of market strength. And while dollar weakness stoked the short squeeze in EM, the Shanghai Composite struggled to end the week little changed. Moreover, seeing German bund yields decline another three bps (to 0.31%) hardly conjures bullish imagery. Financial Instability. Earlier this week Brussels announced that Italy’s budget plans were in “particularly serious non-compliance” with previous commitments the country had made, and justified the opening of an “excessive deficit procedure” against the country. That process will last long into next year before any resolution emerges. Meanwhile this week’s poorly subscribed retail bond sale has dashed the governing parties’ hope that Italian households would provide a fresh source of debt market demand for government paper. The sale raised just €2.2bn over four days, far lower than the usual €7-8bn that BTP Italia sales fetch. Despite this yields have edged down since the start of the week, with 10-year paper seeing a 7 basis point drop to 3.41 per cent, while its spread over the equivalent German bond yield — a widely watched measure of eurozone risk sentiment — is down 5bp at 306bp. Yields’ failure to take another significant step higher is being taken by some investors as an indication that the market is settling at around its current level, or could even retrench. The next steps in Rome and Brussels’ tango have been well flagged. And for now the questions over investor demand for Italian debt can be postponed, as the country has already raised more than 95 per cent of this year’s funding needs. With little further drama expected in the coming weeks, investors are in a position to take stock. “We expect Italian tail risks to abate,” said Peter Chatwell, head of rates strategy at Mizuho, who said that this week’s move by the European Commission “marks the end of this phase of the Italian budget saga”, and the prospect of less intense headline risk “would support BTPs going forward”. As a result, some investors are venturing back into the market. Stéphane Monier, chief investment officer at Lombard Odier Private Bank, said there were “good reasons for looking at owning Italian debt right now” given “the market’s overly conservative pricing of Italian political risk and our assessment is that there is no solvency risk for Italy”. “A lot of the risk is already priced in, with yields closer to those of some emerging economies than other developed economies,” he said. Lorenzo Codogno, founder of LC Macro Advisors and former chief economist at the Italian Treasury, puts a 70 per cent likelihood on Italy “muddling through until the European elections” next May. That leaves investors focused on the economic outlook as one key source of any potential bad news in the coming months. Italy’s growth prospects have caused heated debate. The country’s premier Giuseppe Conte this week wrote to the European Commission to insist that the country was sticking to its much-disputed forecast for next year of 1.5 per cent. The IMF forecasts that the Italian economy will grow 1 per cent in 2019, while on Wednesday Italy’s statistics agency cut its economic growth forecast, saying that Italian gross domestic product would grow by 1.3 per cent in 2019. “If Italy’s growth environment starts to show signs of strain” in the early months of next year, the BTP-Bund spread could face fresh upward pressure, Mr Kurpiel said. Another risk that Mr Codogno flags is the substantial supply of fresh Italian government debt that bond investors will be asked to soak up next year. Rome needs to raise about €260bn of bonds in 2019, of which about €200bn will refinance existing paper that is due to mature. That is likely to pose a challenge, as foreign investors have been shedding their Italian bond holdings in recent months. Foreign investors in Italy’s bond market reduced their holdings by a net €1.5bn in September, taking their total scaling-back since the coalition government took power in May to €68bn, according to figures from the Bank of Italy. And this week’s bond sale has provided further evidence of the weakening demand for Italian paper. As a consequence, Italy’s regular debt sales may become investors’ most closely watched indicator — and any plateau in the country’s bond yields may not be long-lived. “YOU KNOW,” says a trader in “Margin Call”, a film about the crash of 2008, as he stands high on a building above Wall Street, “the feeling that people experience when they stand on the edge like this isn’t the fear of falling—it’s the fear that they might jump.” Suicide fascinates us. It is at once appalling and yet, in the darkest places in our minds, appealing. It is the most damaging sort of death. A child’s suicide is a parent’s worst nightmare, and a parent’s marks their children for life. It is a manifestation not just of individual anguish but also of a collective failure: if society is too painful to live in, perhaps we are all culpable. The suicide rate in America is up by 18% since 2000. This is not merely a tragedy; it matters politically, too. The rise is largely among white, middle-aged, poorly educated men in areas that were left behind by booms and crushed by busts. Their deaths are a symptom of troubles to which some see President Donald Trump as the answer. Those troubles should not be ignored. Nonetheless, beyond America’s gloomy trend is a more optimistic story: that at a global level, suicide is down by 29% since 2000. As a result, 2.8m lives have been saved in that time—three times as many as have been killed in battle. There is no one reason. It is happening at different rates among different groups in different places. But the decline is particularly notable among three sets of people. One is young women in China and India. In most of the world, older people kill themselves more often than the young, and men more than women. But in China and India, young women have been unusually prone to suicide. That is decreasingly the case. Another group is middle-aged men in Russia. After the collapse of the Soviet Union, alcoholism and suicide rocketed among them. Both have now receded. A third category is old people all around the world. The suicide rate among the elderly remains, on average, higher than among the rest of the population, but has also fallen faster since 2000 than among other groups. Why are these people now less likely to take their own lives? Urbanisation and greater freedom have helped. Accounts of those who attempt suicide, and of the relatives of those who succeed, suggest that many young Asian women were driven to despair by violent husbands and overbearing in-laws. As people move to cities and the grip of tradition loosens, women have more choice about whom they marry or live with, making life more bearable. Leaving the village helps in another way, too. Because farming involves killing things, rural folk are likelier to have the means to kill themselves—guns, pesticides—to hand. Social stability is also a factor. In the turbulence that followed the collapse of the Soviet Union, many middle-aged people saw their sources of income and status collapse. Unemployed people kill themselves at around two-and-a-half times the rate of those in work. The financial crash of 2007-08 and the resulting recessions are reckoned to have caused an extra 10,000 or so suicides in America and western Europe. 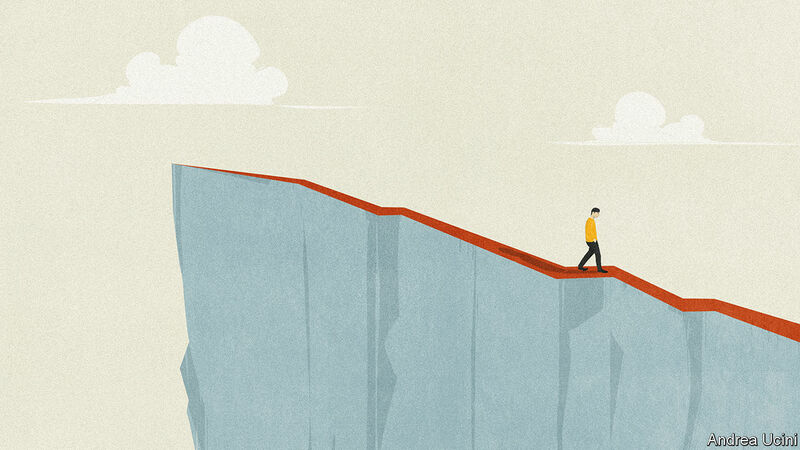 As crises recede and employment rises, so suicide tends to ebb. And falling poverty rates among the old, which have declined faster than among other groups globally, are reckoned to have contributed to the drop in the number of elderly suicides. But the decline is not just the consequence of big social trends. Policy plays a role, too. When Mikhail Gorbachev restricted the production and distribution of booze in the mid-1980s, both drinking and suicide fell sharply. The collapse of the Soviet Union swept those regulations aside, and both drinking and suicide shot up again. Restrictions introduced by Vladimir Putin in 2005 are reckoned to have contributed to the recent decline. Governments can also help limit the consequences of social and economic turbulence. Active labour-market policies, which help re-train jobless workers and ease them back into work, prevent many suicides. And spending on health services, especially those that most benefit the old and sick, can make a big difference: fear of chronic pain is one of the things that leads people to seek a quick way out. The remarkable recent fall in suicide among elderly Britons may have happened in part because Britain’s palliative-care system is the best in the world. Efforts to curb access to the means to kill oneself can help, too. Suicide is surprisingly impulsive. A study of young Chinese women who had tried to kill themselves showed that three-fifths had been contemplating suicide for less than two hours, and one in ten for less than a minute. Of 515 people who had survived the leap from San Francisco’s Golden Gate bridge between 1937 and 1971, 94% were still alive in 1978—which suggests that a suicide postponed is likely to be a suicide prevented. Governments can do a lot to put self-slaughter a little further out of reach. The most toxic pesticides account for one-seventh of suicides. When South Korea outlawed paraquat in 2011, it saw a decline in suicides but no drop in agricultural output. Requiring potentially lethal medicines to be sold only in small quantities, as some countries have done with aspirin and paracetamol, has also been shown to help. But the most effective measure of all is limiting access to guns. Half of all Americans who commit suicide shoot themselves, and the overall rate in America is about twice that in Britain, which has strict gun controls. The difference in gun ownership largely accounts for the state-by-state variation in suicide rates. The media can also do their bit. Suicide is strangely contagious. When Robin Williams, an actor, killed himself in 2014, his method and motives were reported in great detail. Researchers calculated that there were 1,800 more suicides than would otherwise have been expected in the next four months, often using the same method. Journalists should cover such tragedies in less detail, and with more restraint. For a few people—those who are terminally ill, in severe pain and determined to die—suicide may be the least terrible option. In such circumstances, and with firm safeguards, doctors should be allowed to assist. But many of the 800,000 people who kill themselves each year act in haste, and more could be saved with better health services, labour-market policies and curbs on booze, guns, pesticide and pills. America, in particular, could spare much pain by learning from the progress elsewhere. NOT SO LONG ago, a stockbroker trying to interest an American fund manager in European shares would be met with an eye-roll. But sentiment is fickle and attitudes change. These days the likely response is a hard stare. Over the years in which stockmarket returns in America pulled ahead of everywhere else, any residual feelings for old-world shares had slowly turned to indifference and then curdled into something like hatred. For what is there to like? The Euro Stoxx 50 index of euro-zone shares is lower than it was 20 years ago. Earnings forecasts have been steadily cut this year. Political risk—from Brexit to Italy’s budget stand-off with the European Union—is never far away and, seemingly, never resolved. “Call me when it’s over,” is the refrain of many American investors. Do not get them started on Europe’s structural defects: its ageing populations, scarcity of world-class digital firms and fragmented markets. The category of stocks that captures the prevailing euro-misery best is banks. They have everything that makes investing in Europe such a wretched experience. In a dispiriting year for European markets, the shares of banks and financial firms have been among the worst-performing. Even after the selling, they are a fifth of the MSCI pan-European index. The gloom is now so deep that it would take just a few rays of sunshine to give bank shares a lift. For now, though, the news is relentlessly bad. GDP in the euro area grew at just 0.2% in the third quarter. 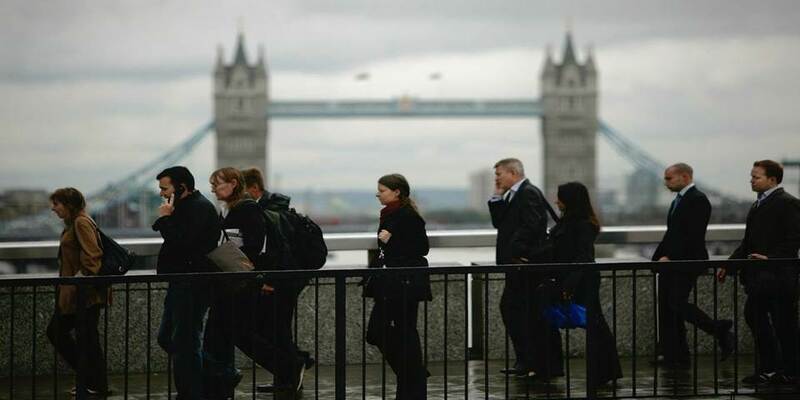 The purchasing managers’ index of activity fell in October to a two-year low. Exports have wilted, notably to emerging markets, where firms listed in Europe earn a third of their profits. 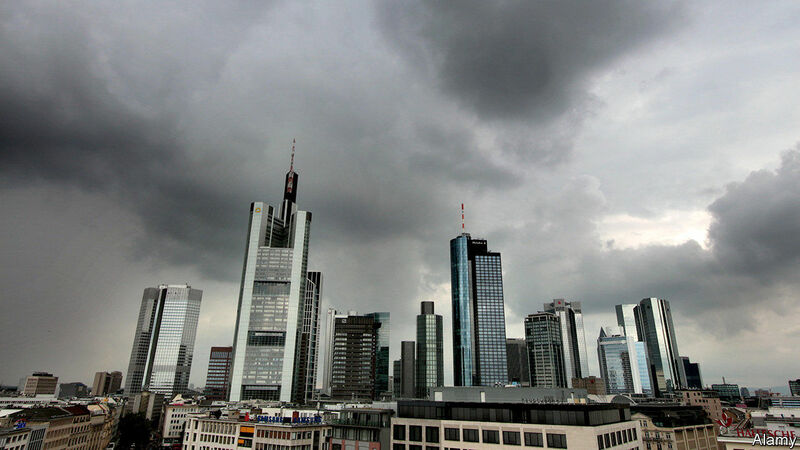 A weak economy defers the day when Europe’s central banks can tighten monetary policy. The delay hurts banks, whose profits depend on the interest rates they charge on loans. Europe’s cyclical failings are entwined with a host of other flaws. Its people are ageing and its businesses seem outmoded. It is not just the preponderance of banks. Stockmarket indices are loaded with makers of cars, chemicals and capital goods—the machine technology of the early 20th century, not the digital tech of the 21st. Nor is Europe a truly continental market in the way that America is. Banking is essentially national. Its capital markets are puny. And it lacks a single set of fiscal-policy tools to go with its single currency. The euro area has no shared deposit protection or unemployment insurance. There are more signs of Europe pulling apart than of it pulling together. One big country, Britain, is going through a messy divorce from the EU. Another, Italy, is feuding with the EU over fiscal rules. The larger these political risks loom, the harder bank shares fall. Is there anything positive to say about them? European banks are a leveraged play on Europe and also on the global economy, says Luca Paolini of Pictet, a Swiss wealth-management group. That cuts both ways. They are hurt badly by bad news; but they can also rally hard on good news. The starting-point is that shares are cheap—banks are priced for something like a calamity. Yet after foot-dragging for a decade on bad loans and capital-raising, their balance-sheets are in decent shape. 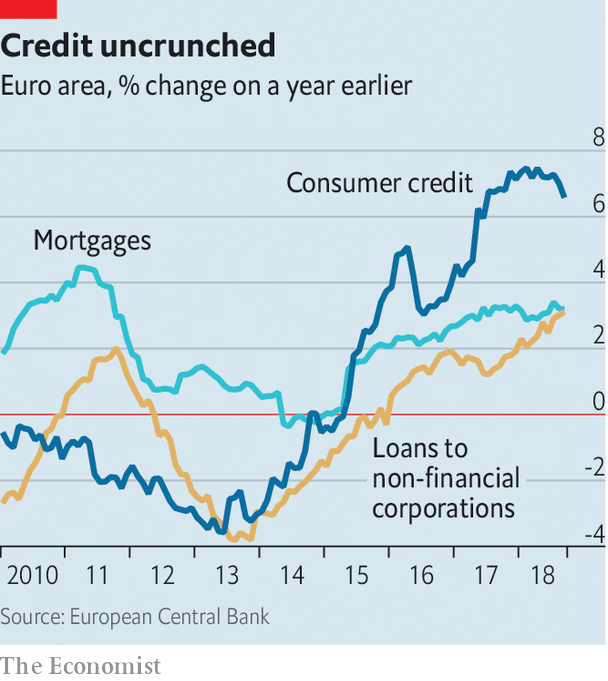 Bank credit in the euro zone is growing again (see chart). A lot of Europe’s political fog would have to clear before its banks could deliver more than a short-term bounce. A softish Brexit would help, of course. So would a truce over Italy’s budget. The euro zone’s structural weaknesses are not going to be fixed quickly. But there has been more progress than is generally recognised. France and Germany recently agreed on a proposal for a European budget. It falls well short of the kind the recession-fighting fund requires. But once it is in place, it might grow in size and flexibility—just as the makeshift rescue of Greece in 2010 evolved into lasting backstops for troubled countries, such as the European Stability Mechanism, a €410bn ($470bn) bail-out fund. The chance that policymakers move towards fiscal integration in this way is around 30%, according to strategists at Morgan Stanley. This would benefit financial stocks most, they reckon. There is one other thing, perhaps a little strange, to say in favour of European stocks, particularly banks: that few investors have anything favourable to say about them. They are a contrarian bet—the antithesis of American tech stocks, which are suddenly out of favour. You buy them when everyone else has given up on them. Isn’t that right now? The United Kingdom’s divorce negotiations with the European Union have dragged on through multiple déjà vu moments, and the consensus among experts is that the economic fallout will be felt far more acutely in Britain than in the EU. But policymakers worldwide would benefit from watching the process closely. WASHINGTON, DC – The singular issue of Brexit has consumed the United Kingdom for two and a half years. The “if,” “how,” and “when” of the country’s withdrawal from the European Union, after decades of membership, has understandably dominated news coverage, and sidelined almost every other policy debate. Lost in the mix, for example, has been any serious discussion of how the UK should boost productivity and competitiveness at a time of global economic and financial fluidity.